Tilley Endurables is a hat company based in Canada. The hats of the company are well known for their durability, their ability to float on, and their great designs. The company also adds in various innovative technologies for water repellent and wrinkle-resistant materials as well as high quality sweatbands and secret pockets for you to hide your essentials, to name just a few. And do you know that Tilley hats come with a lifetime warranty? So you are basically set for life with your initial investment in 1 hat. If you are looking for such a hat to go on a hiking trip or a hunting adventure, check out one of the Tilley hats from their collections. There are a wide range of materials, colors, and features for you to choose from. Let’s us help you by picking out some of the best options that you can have on the market. Q: Where can I buy a Tilley hat? A: You can buy a Tilley hat both in physical stores and online stores. They are available in various department stores such as Marcy’s. You can also check out a wide range of collections of Tilley hats on its official website as well as other retailers’ sites including Amazon, Village Hat Shop, and eBay. Q: How should I wash a Tilley hat? A: Most of the Tilley hats on the market are easy to take care of as the material is rugged and durable. You can wash the hat both in the washing machine and by hand. When you wash a Tilley hat on the washing machine, it is best if you can wash it on a gentle cycle. After you wash the hat, let it dry naturally. Remember not to bleach the hat. You should wash the hat frequently to get rid of sweat stains or else they will rot the hat. Still, always check the labels in your Tilley hat to see if it is washable and to see the washing instructions. For instance, the TTW2 style of the Tilley hat is for dry cleaning only. Q: How should I wear a Tilley hat? A: Most of the Tilley hats are designed to fit low and loose. You can easily adjust the chin cord for a better fit and secure in case of a high wind. Q: How can I shape a Tilley hat? A: After washing a Tilley hat, you can reshape its construction by hand. While the hat is wet, just put your knees in the crown and pull the hat firmly on the opposite side. Never put your Tilley hat in the dryer unless you want your Tilley hat to be deformed. 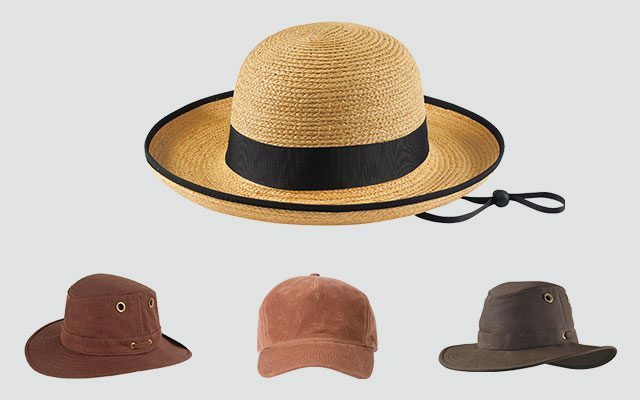 We pick out the best Tilley hat options for both men and women (while some of the designs are unisex and can be worn by both genders). 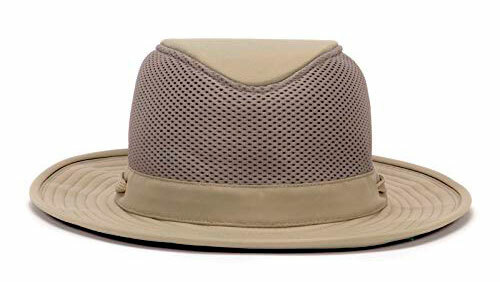 Its Key Features: This Tilley hat is made of 100 % of supplex nylon while the material is made of 100 % of polyester. There are 9 options of colors for you to choose from including black, olive, natural, and multicam. The type of the brim is broad- the back and front of the brim are 3.5 inches in width while the sides are 2.5 inches in width. Review: This hat is made of the high quality material which is rugged and tough but also lightweight and comfortable to wear. Besides the high quality well ventilated material, this hat also has a ¾ inch mesh around crown which allows for extra ventilation. Not to mention the innovative Hydrofil sweatband that adds extra comfort and breathability. Your head will always feel cool and dry even in the hottest summer days. The front and back wind cord helps to keep the hat stay secured on your head. The cord is also highly adjustable for you to easily have a good fit with this hat. 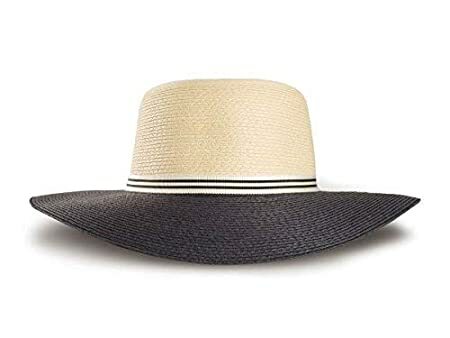 If you are looking for the most modern tilley hats for men with the highest quality and most modern look, check out this stylish and functional hat. This hat is easy to take care of because the fabric of the hat is water resistant and mildew resistant. It is also salt water resistant for you to conveniently take the hat with you everywhere. Its Key Features: This Tilley hat is made of 98 % of organic cotton and 2 % of spandex. It features a flat crown and a medium wide brim. There are 5 options of colors for your consideration including khaki, olive, and brown. The front and back of the brim are 3.5 inches in width. Review: When reading the best Tilley hats reviews, you will know that the most common materials of a Tilley hat are nylon, hemp, and cotton. 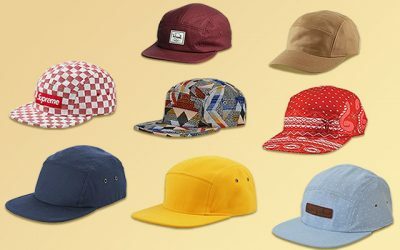 If cotton is your preferred material, check out this hat. The cotton material makes the fabric softer than any fabric which is made from hemp. It is also more breathable than nylon. Moreover, this hat comes with a ¾ inch mesh insert around the top. Therefore, this hat is super well ventilated. It comes with a front and back wind cord system to help keep the hat stay secured on your head. There is an inner pocket which is hidden in the inner side of the hat for you to keep your valuable items. It is made with mesh material and zip to help increase the air flow for your extra comfort. Finally, you will notice that this hat is hand-sewn with an excellent craftsmanship. As a result, all of the seams are lock-stitched and will not unravel even though you have been wearing this hat for a long time. The brim of the hat is reinforced for extra durability. It also helps the brim to stay firm and solid when there is a high wind coming against you. Its Key Features: This Tilley hat is made of 100 % of supplex nylon while the mesh material is made of 100 % of polyester. This hat is available in khaki with olive under the brim. It belongs to the Airflo mesh collection. This hat is available in medium and large sizing options. The sides of the brim are 2.5 inches in width while the front and the back are 3.5 inches. Review: This Tilley airflo hat is made of the premium quality material. The top of the crown as well as the brim is made of a protective fabric, which is rated 50 + UPF. Hence, it provides the maximum protection against the harsh elements of the sun rays. In addition, the fabric is water repellent for you to wear comfortably under the light rain. The brim of the hat is wide enough to offer a large area of your face as well as your neck and your ears. And don’t forget the mesh material of this hat, which helps to circulate air and keep your head cool and dry all of the time. You can easily tie this hat for the most secure fit in the windy weather. Overall, the material of this hat is very tough and durable, which is also mild an mildew resistant. You can wash this hat both with the washing machine and by hand, making it easy for you to take care of the hat. Last but not least, you can find a secret pocket inside the hat for you to keep the essentials, especially when you go on a hiking or camping trip. 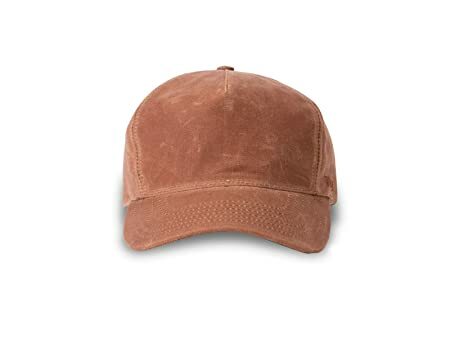 Its Key Features: This Tilley hat is made of 100 % of hemp fabric in mocha solid color. This hat belongs to the Endurables collection. Other details of the hat include the ventilation eyelets, the wind cord system, the innovative Hydrofil sweatband, and an inner secret pocket. The brim of this hat has the “Old Hollywood” broad brim design. Review: This tilley hemp hat is suitable for you on your trip regardless of how the weather is outside. First of all, this hat is made of the premium quality material which is breathable and lightweight. It also comes with an inner Hydrofil sweatband to help wick moisture away and keep your head cool and dry even in the hottest summer days. The ventilation eyelets on the crown also support air circulation for extra breathability. Second of all, this hat comes with a front and back wind cord system to keep the hat stay secured on your head regardless of how windy it is outside. Third of all, this hat is water repellent so that you can comfortably wear this hat under the light rain. Not to mention that the fabric of this hat is rated 50 + UPF to offer the highest level of protection for your skin against the harsh sun rays. The hemp material softens over time but it still stays rugged and durable with neat stitching lines and a solid construction. Besides the classic and vintage look, the brim of this hat is reinforced for extra durability but can be folded up and down depending on the style that you like. Check out the hidden pocket to keep your essential safe while you travel. Its Key Features: This hat is made of 100 % of supplex nylon Tilley Nylamtium while the mesh area is made of 100 % of polyester. There are several options of colors for you to choose from including natural, olive, black, and multicam. 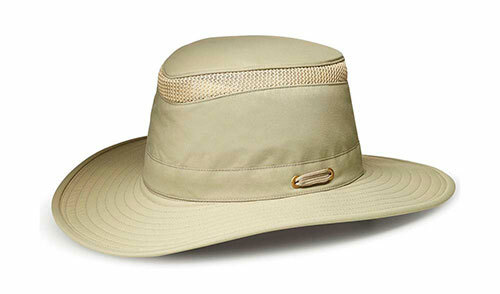 The fabric of this hat is rated 50 + UPF for its maximum protection against the harsh sunrays. Review: This is one of the tilley hats for men with the widest brim. Hence, the hat would provide a lot of coverage for your face as well as your neck and your ears. In addition, this hat is made of the premium quality material which is cool and breathable. Moreover, the hat comes with a ¾ inch polyester mesh in the crown to add extra air circulation for your head. Not to mention that it has a dark underbrim for glare protection. This hat is made of one of the toughest nylon materials that you can find on the market. Thanks to the high quality material, this hat is water and mildew resistant to ensure the hat can last for a very long time. You can easily fold the hat and store it in a small bag, which is very convenient for you if you want to pack light. Finally, the brim of the hat is reinforced with an inner wire that runs along the outer edge. Therefore, it will not become flimsy in case of a high wind. And like most of the other Tilley hats that you can find on the market, this one comes with an inner pocket for you to conveniently store your essentials such as some money bills and room key for easy access. Its Key Features: This Tilley hat is made of 100 % of hemp material. It features a medium brim design. The front of the brim is 2 5/8 inches in width while the sides of the brim are 2 1/8 inches. Review: Weighting only 5.3 oz, this hat is one of the most lightweight Tilley hats that you can find on the market. Thanks to the high quality material, this hat is not only lightweight but also breathable and protective. The fabric of this hat is rated 50 + UPF for its ability to block the harmful elements of the harsh sunrays and protect your skin. Another thing that I love about this hat is that it will age nicely over time. With the exposure to the sun, the hat softens and gets more and more comfortable for you to wear. The inner sweatband is capable of wicking moisture away and preventing sweat from getting into your eyes. Besides the functions to help you wear the hat comfortably in the hot summer days, it also features a front and back wind cord system. This allows you to keep the hat stay secured on your head regardless of how windy it is outside. 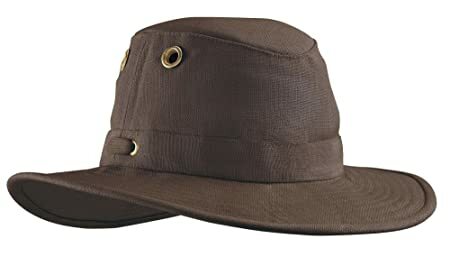 If you are looking for a functional and versatile Tilley outback hat which is super lightweight, this hat is one of the best options for you. 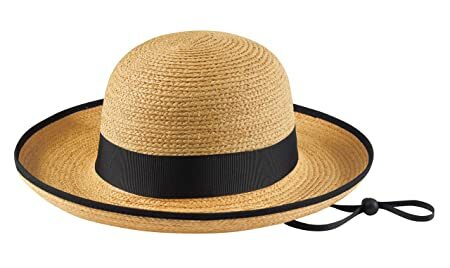 Its Key Features: This Tilley hat for women is made of 100 % of straw. It features a black hatband which is made of 100 % of polyester. The outer edge of the hat is also lined with black lining. This hat also comes with an adjustable chin cord. Review: This hat offers the maximum protection as the fabric is certified 50 + UPF to effectively block the harmful elements of the sunrays. Moreover, the chin cord of this hat is highly adjustable for you to have a better fit with this hat. Also, the chin cord helps to keep the hat stay secured on your head, even when there is a high wind coming against you. The fabric of this hat is woven tightly enough to block the harsh sun rays while it is loosely enough for the breathability of the hat. The sweatband made from the premium cotton material helps to wick moisture away. And you can take the sweatband out for cleaning. Last but not least, this hat is crushable and packable for you to fold it and pack it for storage or carrying around. The construction of the hat is made for heavy duty uses so that it is tough and durable. The brim of the hat is reinforced to stay slightly curved upwards. It is trimmed nicely with no loose thread. It is packable as well for you to easily bring it along with you on your trips. Its Key Features: This hat is made of 100 % of hemp fabric. It is available in nature solid color. It comes with a flat crown and a broad brim. The width of the brim is 3 inches in sides and front while the back is 2 ¾ inches. The design of this hat includes a downward slopping broad brim and a tonal hatband. Review: Like what you would want in a tilley hikers hat, this hat has all the features that you need to ensure you have the best experience when hiking. 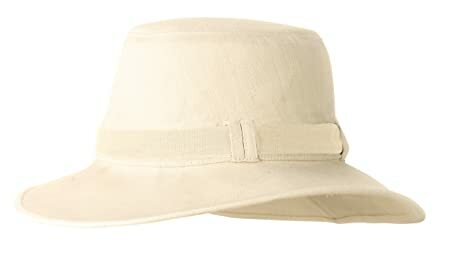 First of all, the fabric of this hat is rated UPF 50 + to effectively block the harmful elements of the harsh sunrays from getting on your skin. In addition, the brim of the hat is wide enough to provide a lot of protection for your face as well. Still, the back of this hat is not as wide as other wide-brimmed hats. The material of the hat is also breathable and well ventilated. The inner sweatband adds extra comfort and coolness to your head. This hat is made from the tough hemp material making the hat mold and salt water resistant. Last but not least, this hat is so lightweight that you will not feel any burden even when you have to wear the hat for a long time. You can expect the fabric of this hat to be tough and rugged. Still, the hat will soften after you wear the hat for a long time for you to feel more and more comfortable wearing this hat. The downward slopping broad brim brings a gorgeous and elegant look to any lady. It is also easy for you to pair it with a wide range of clothes and dresses that you can have in your wardrobe. Its Key Features: This hat is made of 100 % of hemp material. This hat is available in natural color with black hatband and black edge of the brim. It features the design of a classic summer hat with the slightly curved up brim. Review: This tilley hemp hat is made of hemp- which is the strongest and most rugged types of natural fiber that you can find on the market. Hence, you can expect this hat to be strong and super durable. It is weather resistant for you to wear throughout many seasons. 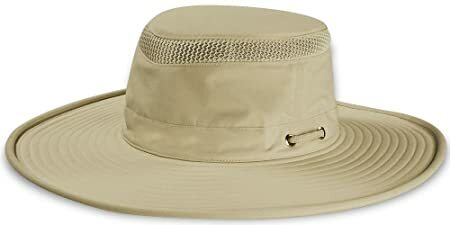 The fabric of this hat is also rated 50 + UPF for the excellent sun protection. Moreover, this hat is breathable and lightweight so that you will not feel any burden even when you have to wear the hat for a long time. This hat comes with a tuck-away chin strap to help keep the hat stay secured on the head, regardless of how windy it is outside. The brim of this hat is reinforced so that it will not become flimsy as well. And you can choose to fold the brim up and down depending on the design that you like. 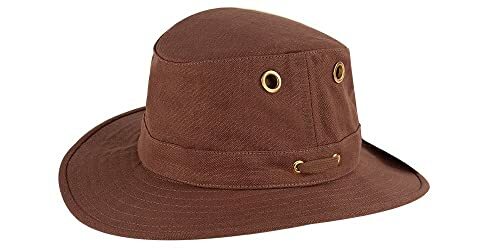 This hat can be crush and fold as well. When you take the hat out, it will spring back to its original form. The most significant feature of this hat is the design of the hat, which is elegant and feminine. Also, with its solid colors and design, you can wear it to a range of casual occasions. 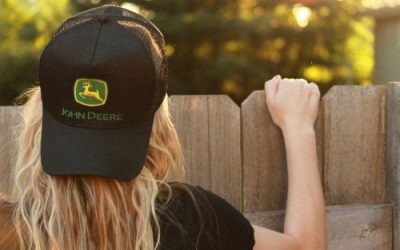 Its Key Features: This Tilley hat with the broad-brimmed design is made of 100 % of polyester material with the mesh lining part on the crown. There are 2 options of colors for you to choose from including cream crown with navy brim and solid black. Review: This hat comes with the nicely processed quality for a lightweight and comfortable hat to wear. 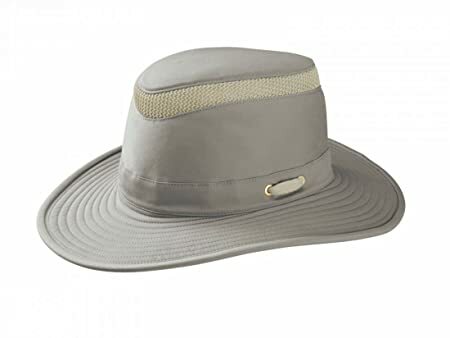 And like other high quality tilley sun hats that you can find on the market, the fabric of this hat is certified UPF 50 + for the maximum protection for your skin against the harsh elements of the sun rays including the UVAs and UVBs. The brim of the hat is also wide enough to offer a lot of coverage for your face as well as your neck. You should also expect this hat to be breathable with the mesh lining to aid air circulation. Moreover, this hat comes with an inner sweatband to help wick moisture. Another thing that I love about this Tilley hat is that the sweatband can be removed for you to easily clean it. Even when you wear the hat for a long time, odor will not be able to develop inside the hat. Finally, you can crush and pack the hat into a small bag for easy storage and carrying around. With its style, you can wear this hat not only when you go camping and hiking. You can also wear this hat when you take part in other outdoor activities such as when you go to the beach or the pool. You can also wear it when you do your gardening as well. Its Key Features: Are you looking for tilley golf hats? Check out this unique and functional trucker cap. There are 3 options of colors for you to choose from including brown, red, and black. It is made of 100 % of cotton featuring the design of a classic baseball cap with a 6 panel construction and a slightly curved visor. Review: This hat is made of the high quality cotton material which makes the hat lightweight, breathable, and comfortable to wear, even for a long time. While there are no ventilation eyelets on the sides of the crown, the material of this hat is so well ventilated that it can keep your head cool and dry in a hot summer day. Moreover, this hat comes with an inner sweatband which is capable of wicking moisture away and preventing odor from developing inside. Although this hat is available in 1 size, the sweatband is stretchy enough to provide you a comfortable fit with this hat. It also comes with an internal size adjustment device to help accommodate the base layers. This hat is also made with an excellent craftsmanship as well. For instance, it features a wax finish on the hat, which makes the hat water repellent for you to wear it under the light rain. The overall construction of the hat is very firm and solid with neat stitching lines for extra durability. The fabric of this hat is also thick enough that in case you are looking for a tilley winter hat, you can consider this option. Its Key Features: This Tilley hat is made of 100 % polyester featuring the natural color. This hat features the hat band with a knot detail on the back of the hat. The height of the crown is 4 inches while the brim of the hat is 3.5 inches in width. Review: Thanks to the high quality material, this hat is lightweight and comfortable to wear. 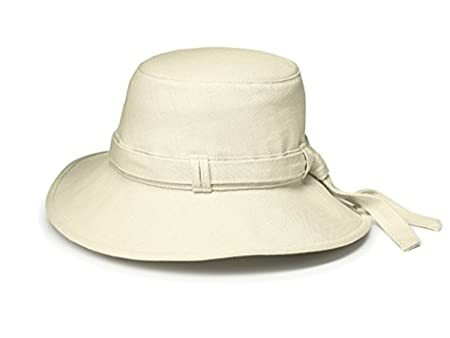 The fabric of the hat is rated 50 + UPF to offer the highest level of protection for your skin against the harsh sun rays. In addition, it is water repellent so that you can enjoy wearing this hat in case of a light rain. The front and back wind cord system helps to keep the hat stay secured on the hat even when there is a high wind coming against you. 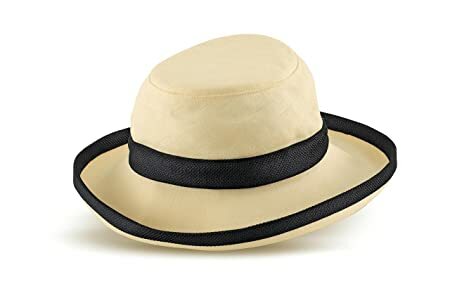 While the fabric of the hat is thick enough to provide a lot of protection for your skin against the harmful elements of the sun rays, this hat is still cool and breathable enough to wear in a hot day. The hydofil sweatband is capable of wicking moisture away and keeping your head cool and dry all of the time. The downward sloping brim along with the knot detail adds the extra elegancy to the look of the hat. With the solid color and beautiful design, you can wear this hat not only for your outdoor adventures but also for daily wear. 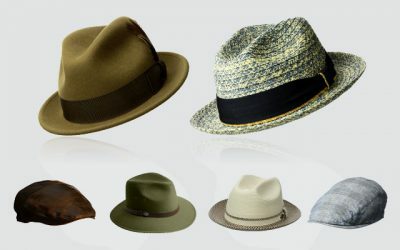 That is all about the best Tilley hats that you can find on the market for both men and women. With the recognized reputation and popularity, the Tilley hats are surely made of the premium qualities with an excellent craftsmanship and great attention to details. The hats from our picks are among the best qualities with the great designs as well that will surely make you look good on every of your hiking or hunting adventures. We hope that with our reviews of the best Tilley hats here, you can quickly find a great hat with the great features that you would need to ensure you have the most comfort in all of your adventures in the future.